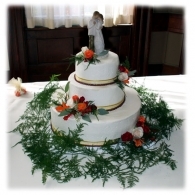 You’ve dreamed of this day for so long and pictured your beautiful wedding cake as the sweet centerpiece of all your planned perfection. 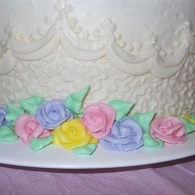 At Delectables, it is our pleasure to turn your dreams into reality by creating the wonderful cake you’ve always wanted for this, your very special day. Whether your reception is to be a simple celebration with just a few guests or a lavish affair, rest assured, your dreams are safe with us. 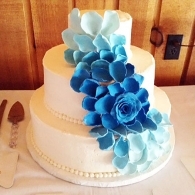 We will work carefully with you to either replicate a design for your cake that you provide for us, or to create a uniquely original cake design incorporating your own ideas and the colors you have chosen for your wedding’s theme. 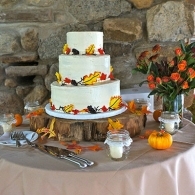 Delectables is also aware of every bride’s need to fit her occasion to her budget. 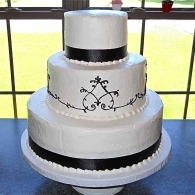 We are proud of our reputation, earned over these many years we’ve been in business, for giving just as careful attention to the details on our smallest wedding cakes as we do to the largest, most ornate. 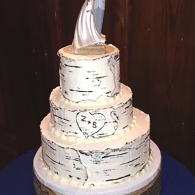 Every bride — and every wedding — is special to us; and you will feel this for yourself when you see the fantastically lovely, wonderfully delicious cake we’ve made especially for you. 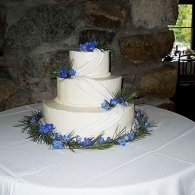 Editor’s note: Please tell Delectables you discovered them on Adirondack Weddings Magazine!